Tacos… a genius invention. I was never a huge fan of tacos until about a year ago. Even now I don’t have them often, but I do find it’s a fun way to get people to try new vegetables and sauces that they might not have otherwise tried. If I offered someone a beet salad they may run away, but if i say beet tacos all of a sudden they are intrigued. I was trying to come up with a fun idea for my Fall Favorites workshop a few months ago - and all I knew was that I wanted a hands-on recipe that resembled the colors of fall. 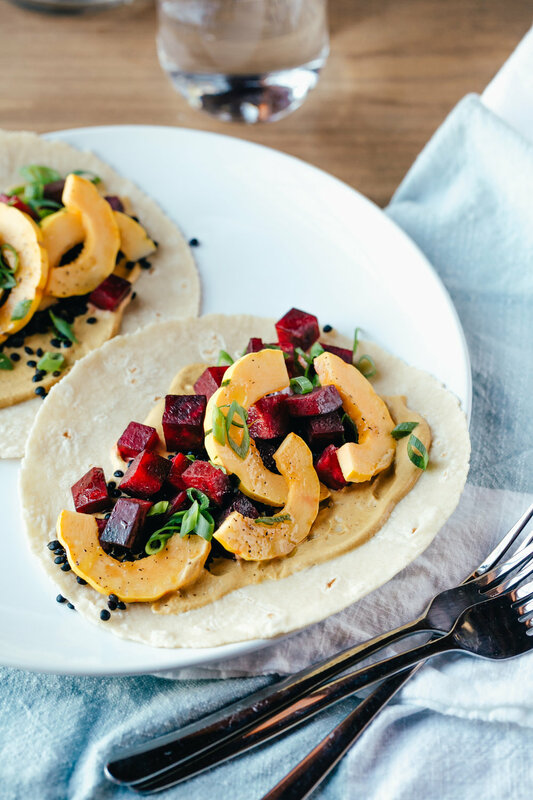 One morning I woke up with the genius idea of beet and delicata tacos with a cashew pumpkin sauce. My sister thought it sounded awful, and she wasn’t wrong - it does sound a bit strange - but I promise you it’s wonderful. If you can get behind the idea of eating beets you are going to be pleasantly surprised by these tacos - especially the sauce! However, if beets truly aren’t you’re thing, feel free to sub them for another vegetable and make it your own! 1. Pre heat your oven to 375 degrees Fahrenheit. 2 . Place your sliced squash and diced beets on a baking sheet and gently coat with olive oil. Bake for 30-40 minutes or until the squash is slightly crispy and the beets are soft. 3. Using a stock pot or a rice cooker, combine your 1 cup of dry black lentils with 3 cups of water and cook according to package directions or until the water is absorbed. Lentils should be soft but not mushy. 4. Dice your green onions and set them aside for topping. 5. As your vegetables cook, you can make the sauce if you haven’t already. 6. Once your sauce is ready and your vegetables and lentils are cooked, you can assemble your tacos. Start by heating up your corn tortillas so they are soft and slightly warm. Place a dollop of sauce onto each tortilla and spread to the edges. Add ¼ cup of black lentils, ¼ cup of the squash and beet mixture, and a sprinkling of green onion. Blend all ingredients in a high-speed blender until smooth. You may need to add more water if it is top thick to blend. Store in the refrigerator in an airtight container for up to 7 days.